Multi-webcam Cast(MWC) includes MWC-Server and MWC-Client. MWC-Server captures images from any capture devices including USB cameras, TV cards and analog devices, and then broadcasts the live video all over the network. 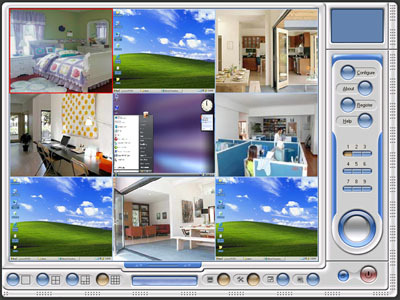 MWC-Client receives the broadcasting and displays up to 9 webcams simultaneously on your own screen. Besides, the client can connect to the server's desktop and operate it using local mouse. ...... and keyboard as if being in front of the server. * Capture images up to 30 frames per second. * Display up to 36 remote webcams simualtaneously. * And display up to 9 screens simultaneously. * Use your own keyboard and mouse to control remote desktop if you like. What can you do with Multi Webcam Cast? Lots of things! Our customers are using Multi Webcam Cast for a variety of tasks: teaching in several classrooms simultaneously, monitoring servers, collaborating with a co-worker, presenting your work to your fellow workers, and more. Teach in several classrooms simultaneously. If you are a teacher , using Multi-webcam Cast, you can teach in one classroom(or even in your office) and broadcast your screen,video and sound to several classrooms. Qweas is providing links to Multi Webcam Cast 3.9 as a courtesy, and makes no representations regarding Multi Webcam Cast or any other applications or any information related thereto. Any questions, complaints or claims regarding this application Multi Webcam Cast 3.9 must be directed to the appropriate software vendor. You may click the publisher link of Multi Webcam Cast on the top of this page to get more details about the vendor.